These new recruits are leaning how to drill. Some writers may sit down and begin writing without an outline, character study, or ending, but I have found that without some direction, I end up scrapping a lot of what I write. Everything in a story must be directed to identifying a problem and solving the problem. It is too easy to go off on a tangent if the writer isn’t focused. A genre helps to narrow the focus. What type of story will I write? A mystery? A romance? An adventure? Certain tools help to define the story and focus the writer. Describe the novel in one sentence. That will define the genre. Start with conflict and tension to raise questions, arouse curiosity, and create the need for resolution. The opening scene should be dramatic and grab the reader’s attention or piqued the curiosity and interest of the reader. Start with the story you’re telling not the back story. Throw the reader into conflict and let them know characters through their actions. Define the problem which will define the genre. Give the reader something to wonder about and a sense of where the story is going and what is at stake. The genre is a romance but why is the romance important to the character now? What is the urgency in falling in love? In Gone With The Wind Scarlett needed to reveal her love to Ashley because he was going to announce his engagement to Melanie. Avoid explaining to much too soon – don’t be obvious – let the story explain itself. 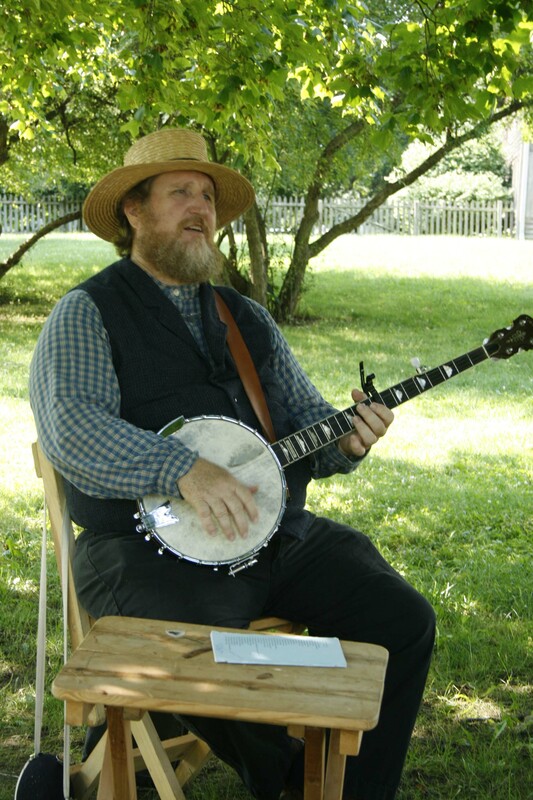 Banjo player at Hale Farm and Village in Bath, Ohio. The first time a character is introduced, make an impression. Show the character doing something that defines him. Show how others react to him. This goes for heroes and villains. Introduce one character at a time and avoid groups that may confuse the reader. Stick to one name for the character except in dialogue. Each character should have a main trait to help the reader identify him. Begin with minimal description and add to it and build layers through different situations and challenges. The main character’s traits should relate to the story line and are revealed through an event or action. Add traits to compliment the dominant traits. Add a habit that will help readers identify him. Show how the character will face his problem (every story must have a problem to be solved) and how a contrasting trait or negative trait may impact how the character solves the problem. Challenge dominant traits in situation that force decisions based on those traits. The character must change because of the problem. A cynic about love finds true love. Create a clear vision of the character through appearance, action, and reaction along with dialogue and show the reader. Don’t say the character was afraid. Show the character trembling or running away. Television and movies show a character’s thoughts through action. A writer needs to do the same. A good way to build this skill is to make a list of adverbs or emotions and then describe the same action. A plot is a plan of action – usually to solve a problem. The problem is related to the genre of a story. In a mystery the problem is a crime or murder, and the plot is how the detective solves the crime and captures the criminal. In a love story, the problem keeps the lovers apart until the end of the story, and the plot is how they resolve their differences and find true love. To write a plot, the writer needs to determine who is at greatest risk because of the problem? Usually the hero. In the murder genre, the detective may have a personal stake to elevate his motivation or it may be his job, but the character needs to solve the problem above all else. In a love story the couple can’t live happily ever after without each other and the plot contains internal emotional struggles and lesser external conflicts that may keep them apart to create the ups and downs of the plot. Each conflict and obstacle increases the stakes with increased emotional damage in a romance because the more a person is in love, the more they have to lose. Many stories are written in the style of three act plays. Each section is a mini-story which must hold the reader’s interest. The first act introduces the problem. Second act adds a twist or surprise, and third act makes things appear hopeless with a satisfying resolution. The three key events each have a point of tension in each one. 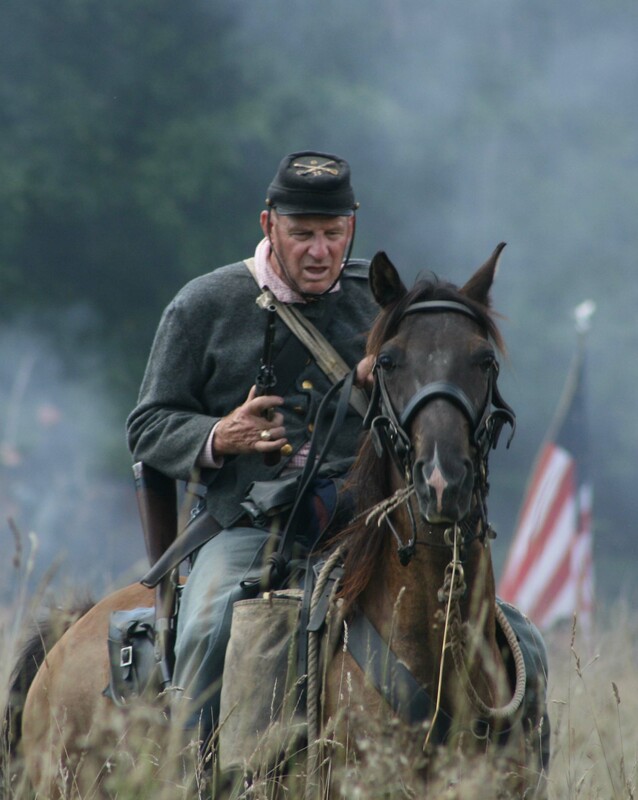 This Union cavalry soldier is ready for battle at Hale Farm and Village in Bath, Ohio. A photo can help create a character. Start with a character’s name and physical characteristics of age, ethnicity, height, weight, hair, and eyes. Add clothing and mannerisms or quirks. 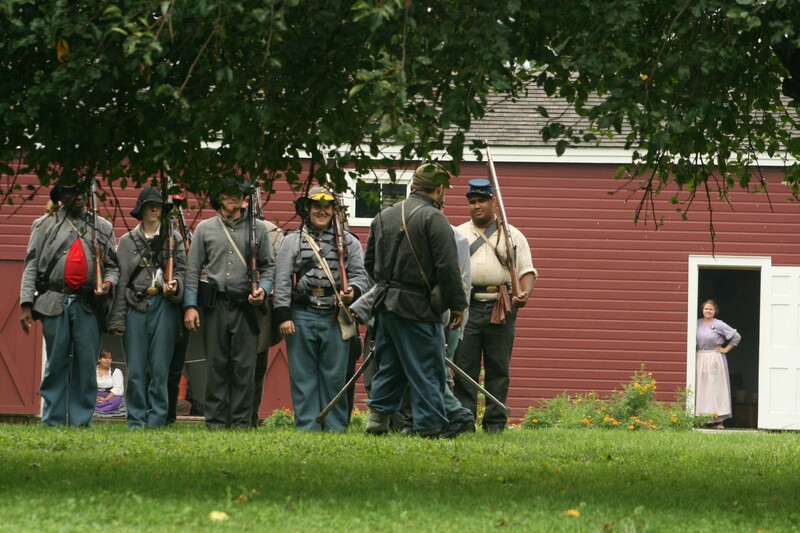 Develop a family, education, job, and past history. Does the character have any favorite words or phrases that will identify him when speaking? Choose a favorite food, music, hobby, or pet to set him apart from other characters in the story. Is there a fear, family secret, dream, or prized possession that will influence his decisions in the story? Include any past traumas, guilty experiences, proud accomplishments, or desperate motivations. Show the characters personality through his action and dialogue and define it early in the story. 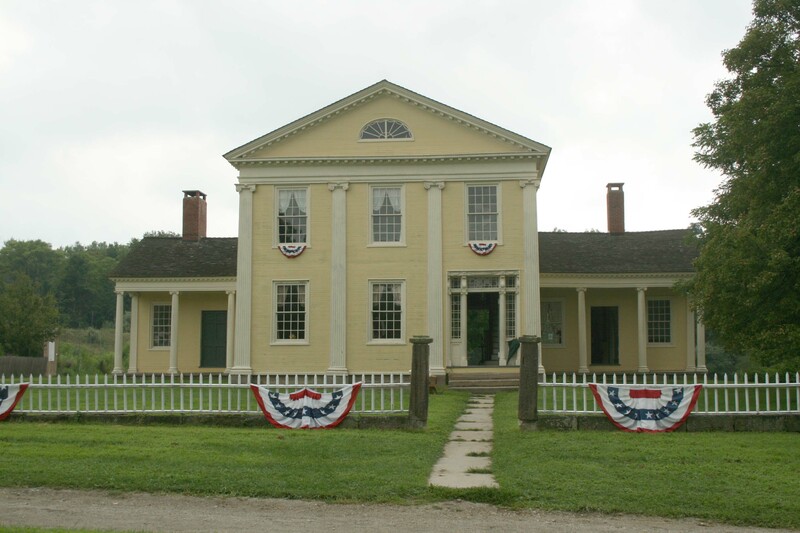 This house is at Hale Farm & Village in Bath, Ohio. 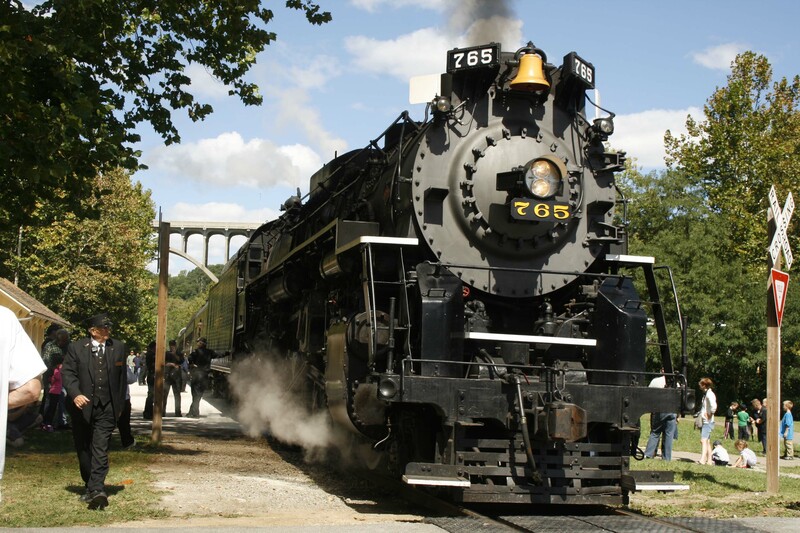 I have been a reporter for ten years and cover the historic town of Hudson, Ohio. I’ve won the Press Club of Cleveland’s Ohio Excellence in Journalism award in 2013 and 2014 and the Ohio Newspaper Association awards in 2011, 2013 and 2014. 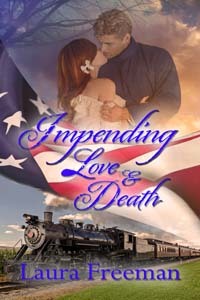 I have written my first novel, a historical romance with suspense, Impending Love and War, which is available at The Wild Rose Press http://www.thewildrosepress.com. Now I’m working on my second novel, Impending Love and Death.